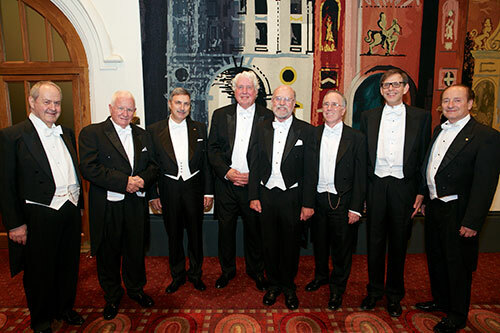 The 2015 Onassis Prizes, awarded to the world’s foremost academics in the fields of finance, international trade and shipping, were presented at the Guildhall in the City of London on Monday 14th September 2015. The prestigious prizes, each worth $200,000, are sponsored by the Alexander S. Onassis Public Benefit Foundation and awarded every three years by Cass Business School, part of City University London, jointly with the Onassis Foundation, in association with the City of London. Each of the Prize recipients delivered a lecture on their area of expertise at Cass Business School. This was followed by a banquet at the Guildhall when the Prizes were presented which was attended by senior representatives of Finance, Trade and Shipping Communities of the City of London and other capitals. Speaking at the banquet, The Senior Alderman Below the Chair, Lord Mountevans, Jeffrey Evans, said that for many, this is the Nobel Prize for Shipping, International Trade and Finance. He continued: “In a time of great change, shipping is a constant, with over 80% of international trade transported by sea and meantime, trade is predicted to double in the next 20 years. This is a very important business indeed – a crucial business”. Two academics - Professor Emeritus Stewart C. Myers and Professor Richard Roll – shared the 2015 Onassis Prize for Finance. “This Prize, in a way, is a recognition of how exciting and important corporate finance is as a part of the broader field of financial economics. Corporate finance combines serious theory, extensive opportunities to do empirical work but also a responsibility to figure out how to value things better in a corporate context and how to advise corporate financial managers to make better decisions”. “This is an incredible honour and I really appreciate the dignitaries that are here and the Onassis Foundation. Of course, I don’t have to say anything about financial economics, it’s the greatest career that somebody could have had and it still is the most important thing in the world, really”. “This is a humbling and wondrous occasion, I still marvel that after 35 years someone is still willing to pay me to indulge my intellectual curiosity, to think about things that interest me and that I think are important to society. I am also gratified that this Award focuses on International Trade, which has fascinated me ever since I began collecting coins as a child and which I think is incredibly important for society but so poorly understood and always at risk of being a political scapegoat”. Two academics – Professor Emeritus Trevor D. Heaver and Dr Martin Stopford – share the 2015Onassis Prize for Shipping. “I’m here because of good fortune I have enjoyed from my school days to today. I went on to be a part of supportive academic and business communities in Vancouver - the award really belongs to those communities of which I have been a member. I’m sure it will help advance maritime studies in Vancouver and more widely”. “I can’t tell you how pleased and surprised I am to find myself standing here this evening…my grateful thanks to Clarkson’s for teaching me what shipping economics is really all about - this is a company which was set up in 1852 and has never made a loss. Brokers play an enormous part in making the shipping business work and bring all of the different parts of the business together”. “Onassis became famous in his lifetime, and after, for his mastery of the science and art of Shipping, Trade and Finance. The Onassis Foundation is proud to associate once more the name of its Founder with the Corporation of the City of London and the Costas Grammenos Center for Shipping Trade and Finance (City University London) which respectively are world centers of the practice and academic study of these three entrepreneurship areas. This third edition of the Prizes is on an unparalleled level”. “The Onassis Prizes honour lifetime academic achievement in areas which have not previously had a platform for global recognition. I warmly congratulate the winners whose distinguished achievements have profoundly influenced their disciplines and continue to have an impact on academic thinking and business conduct worldwide”. The prize recipients were announced by the Lord Mayor of the City of London, Alderman Alan Yarrow, at a ceremony in Mansion House in March 2015. The Onassis Prizes panel of judges consists of: Dr. Anthony S. Papadimitriou, President, Onassis Foundation; Professor George Constantinides, Leo Melamed Professor of Finance, University of Chicago; Professor Costas Th. Grammenos, Chairman of the Costas Grammenos Centre for Shipping, Trade and Finance, Cass Business School, City University London; Professor Elhanan Helpman, Galen L. Stone Professor of International Trade, Harvard University; Professor Robert C. Merton (Nobel Laureate) School of Management Distinguished Professor of Finance, Massachusetts Institute of Technology; Professor Myron Scholes (Nobel Laureate) Frank E. Buck Professor of Finance, Emeritus, Stanford Graduate School of Business; and Professor Eddy Van de Voorde, Professor of Port and Maritime Economics, University of Antwerp. The Onassis Public Benefit Foundation is named in honour of Alexander Onassis, son of the Greek shipping magnate Aristotle Onassis, who died in 1975.